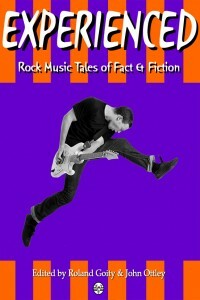 Experienced: Rock Music Tales of Fact & Fiction is a kickass and surprisingly heartfelt anthology that covers the brightly lit front rooms, the shady back rooms, and all the in-between-hard-to-classify rooms of the rock music world from the last few decades to today. It’s a greasy, well worn road map of music and culture, decorated with drawings of memorable groupies and sweaty venues (there are actual drawings in the book, too, and they’re awesome) and smeared with enough resin and LSD to keep you grinning and giggling for hours. Tim Weed’s Steal Your Face recounts the misadventures of a young man as he follows the Grateful Dead, during which time he must contend with drug fueled crowds, exploding VW buses, and his own fuzzy expectations about romantic relationships. There’s a very real and touching nostalgia seeping through these pages, a steady drip that induces bittersweet twinges in the stomach. It’s being old enough to witness the evolution, to recognize landmarks representing a different era. Experienced is the elders brushing shoulders with the young pups as they adjust with the times, or as they pass the respective torch and step aside. In Brian Goetz’s Heavy Lifting Days, we’re shown the old school DJs who carry actual pianos to their gigs, and then we’re shown the slick and efficient DJs of the digital age who carry little more than a laptop and an iPod. The book as a whole is a pure pleasure to read. Blending and bursting with fact and fiction, it delves into the hardships of being a gay harmonica player (Brad Kava’s Road Life Wearies Harmonica Virtuoso) the pressure and enjoyment of doing a late night radio show where the most popular caller is a potential murderer (Scott Nicholson’s Dead Air) and the juxtaposed anxiousness and calm that comes with Bowie daydreams (Adam Moorad’s David Bowie against the Enemy) to name just a few. Experienced is also a road map of hopes and dreams, and of days gone by. It’s a call to reminisce, to shine the spotlight on the young men and women still kicking beneath our sagging skins. In this way it doesn’t matter whether or not there are holes in our rock history because the recurring message is universal: This whole life business ain’t easy, but that’s what makes it great.